Danish philologist; born in Ebeltoft, Jutland, July 19, 1833; brother of Gottlieb Siesby. He graduated from the University of Copenhagen (B.A. 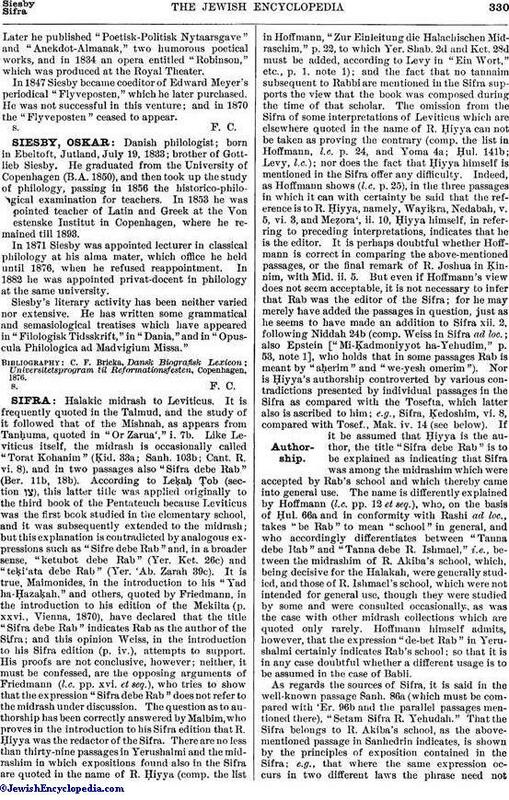 1850), and then took up the study of philology, passing in 1856 the historico-philological examination for teachers. In 1853 he was appointed teacher of Latin and Greek at the Von Westenske Institut in Copenhagen, where he remained till 1893. In 1871 Siesby was appointed lecturer in classical philology at his alma mater, which office he held until 1876, when he refused reappointment. In 1882 he was appointed privat-docent in philology at the same university. Siesby's literary activity has been neither varied nor extensive. He has written some grammatical and semasiological treatises which have appeared in "Filologisk Tidsskrift," in "Dania," and in "Opuscula Philologica ad Madvigium Missa." Universitetsprogram til Reformationsfesten, Copenhagen, 1876.